Santa Ana is a city in California. It is the county seat and has the most people of any city in Orange County. It is the 53rd biggest city in the United States. In 2007, 339,555 people lived in Santa Ana, and it is guessed that the city had 355,662 people living there in 2009. The city was founded in 1869. It is in Southern California on the Santa Ana River, 10 miles (16 km) away from the ocean. The 2000 United States Census said that Santa Ana has the 4th most dense population of US cities with more than 300,000 people. The Santa Ana Freeway (Interstate 5) goes through the city. It also has the same name as the Santa Ana Mountains and the Santa Ana winds that cause fires in Southern California. Santa Ana is part of the Greater Los Angeles Area. ↑ "2000 Census: US Municipalities Over 50,000: Ranked by 2000 Density". Demographia. Retrieved June 14, 2009. ↑ "The Santa Ana Winds". people.atmos.ucla.edu. 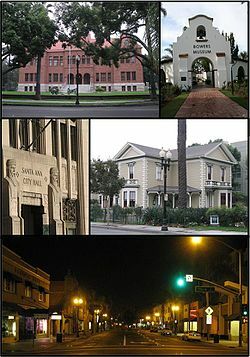 Wikimedia Commons has media related to Santa Ana, California.